A parliamentary report of 1777 recorded a local workhouse in operation at Allhallows with accommodation for up to 6 inmates. County of Kent: Allhallows, Cooling, High Halstow, Hoo, St James — Isle of Grain, St Mary, Stoke. The population falling within the Union at the 1831 census had been 2,623 — with parishes ranging in size from from Cooling (population 131) to Hoo itself (910). The average annual poor-rate expenditure for the period 1833-5 had been £2,419 or 18s.5d. per head of the population. 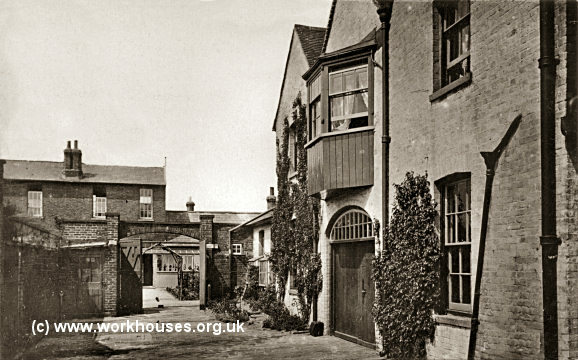 After 1930, the workhouse buildings were used as local council offices but were demolished in the 1960s. In December 1840, The Times, which opposed the New Poor Law and regularly gave prominence to stories critical of the workhouse system, published a story from their "Rochester Correspondent" alleging serious misconduct by the master at Hoo, James Miles. Upwards of half-a-dozen girls in the Hoo workhouse, some of them verging on womanhood, have at times had their persons exposed in the most brutal and indecent manner, by the Master, for the purpose of inflicting on them cruel floggings and the same girls, at other times, have, in a scarcely less indecent manner, been compelled by him to strip the upper parts of their persons naked, to allow him to scourge them with birch rods on their bare shoulders and waists, and which, from more than one of the statements from the lips of the sufferers, appears to have been inflicted without mercy. One girl says, 'My back was marked with blood.' Another, a witness, who had not herself been punished, says, 'We women were called to hold one of the girls while the Master flogged her; but we went down in the yard out of the way, because we could not bear the sight; afterwards we got ointment out of the sick ward to rub her back, for it was all cut to pieces.' Again, `One Sunday the Master flogged little Jemmy (a pauper's illegitimate child, then two years of age) with a birch rod, so that the child carried the marks a month, because it cried for its mother, who was gone to church, and for its little brother, who was that day put into breeches, and taken away from the children's ward. Miles, a former baker, whom the Times described a "sinewy strong man", was subsequently revealed to have a medical complaint requiring violent exercise for the preservation of his health. This, commented the paper, was apparently remedied through two regular activities — hunting, and the beating of children. Miles was dismissed from his post but apparently not prosecuted. Medway Archives Centre, 32 Bryant Road, Strood ME2 3EP. Holdings include: Guardians' minutes (1835-1930); Births (1838-1922); Deaths (1838-1922); Creed register (1869-82, 1900-23); Admissions and discharges (1906-23); Punishment books (1851-1918); Ledger (1835-1930, with gaps); etc. Ancestry currently has: Workhouses dmissions and discharges (1906-23); Hospital admissions and discharges (1899-1924); Births (1838-45, 1848-76, 1881-1914); Deaths (1827-78, 1881-1917); Creed registers (1869-82, 1900-22); Lunatics register (1928); Punishment book (1851-1916); Removals (1842-1929).